It's probably not too late to get tickets to a show this week at one of the many fine Indianapolis area theatres. But if you like to plan ahead, we have your spring guide to the stage covered right here. What's hot in Indy? Check out the schedule and ticket information for the upcoming spring season. Booth Tarkington Civic Theatre is wrapping up their Centennial Season! Don't miss the final show of the season. Lovingly ripped off from the classic comedy film Monty Python and the Holy Grail, Spamalot retells the legend of King Arthur and his Knights of the Round Table in the irreverent signature style of Monty Python. Set to an upbeat score with clever lyrics and plot twists, Spamalot also features a bevy of beautiful show girls, not to mention cows, killer rabbits, and French people. Join King Arthur and the Knights on their musical quest for the Holy Grail and experience one of the greatest, and certainly one of the funniest, Broadway musicals of the modern age! Enjoy a romantic date night on the town in Indianapolis at the Indiana Repertory Theatre. Hurry over to see one of the last shows of Sherlock's most terrifying adventure! Touches the heart of anyone who has one. For an intimate, contemporary theatre experience, head to the Phoenix. Their spring lineup looks intriguing! Americans crave celebrity. Whether we’re reading People, or watching E!, or inhaling the newest celebrity biography, we want to know what their lives are like. But how many of us actually get to engage with our celeb-crushes? Or even take the time to imagine what that interaction might entail? That’s where playwright, Jonathan Tolins, steps in to satisfy our craving, in a whimsical and fictionalized telling of a day in the life of employment to Barbra Streisand. Alex More has a story to tell. A struggling actor in L.A., Alex takes a job working in the Malibu basement of the beloved megastar, Barbra Streisand. One day, the Lady Herself comes downstairs to play. It feels like real bonding in the basement, but will their relationship ever make it upstairs? This hugely successful Off-Broadway hit is an outrageous one-man comedy about celebrity, the oddest of odd jobs and the pursuit of utopia. Walk to dinner and a night at the theatre in downtown Indianapolis. Theatre on the Square, or TOTS, is within walking distance of amazing bars and restaurants in the arts district of Mass Ave. Welcome to the darkly comic world of Shel Silverstein, a world where nothing is as it seems and where the most innocent conversation can turn menacing in an instant. The ten imaginative plays in this collection range widely in content, but the style is unmistakable. “Thoughtful, funny…One of the top ten plays of 2012.” —Entertainment Weekly. What shows are you excited about seeing this spring? 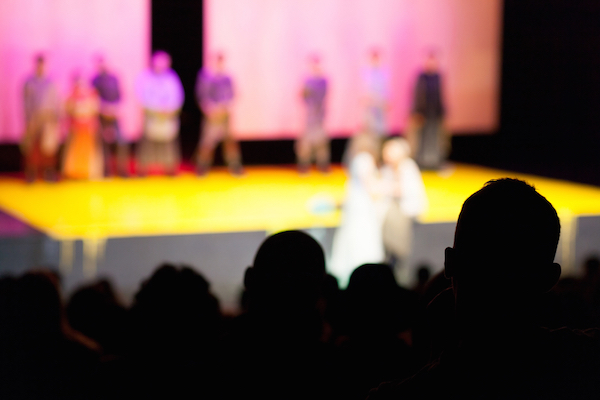 Share your favorite Indianapolis theatre scene tips in the comments below!